NEW LISTING. Be the FIRST to provide review on this 5 star property at Valhalla which is centrally located directly across the street from the Village entrance and shopping. This unit shows Beautifully and is updated throughout. Quality finishing and designed for comfort. Good size private foyer ideal for ski storage, step up into the living area to find a modern, bright and spacious living room, lots of natural light and views of the mountain. Also comfortable gas fireplace. High end kitchen with full size stainless steel appliances, breakfast bar for 2 and separate dining for 8. Living room sofa converts to double sofa bed. Master Bedroom offers Queen Size bed, large screen TV, full en-suite bathroom and sundeck. 2nd Bedroom has Double Bunk bed ( double on bottom and twin on top, plus trundle PULL out twin below if needed) large flat screen TV plus additional full bathroom. Additional powder bathroom on main floor. In-suite laundry on upper floor. 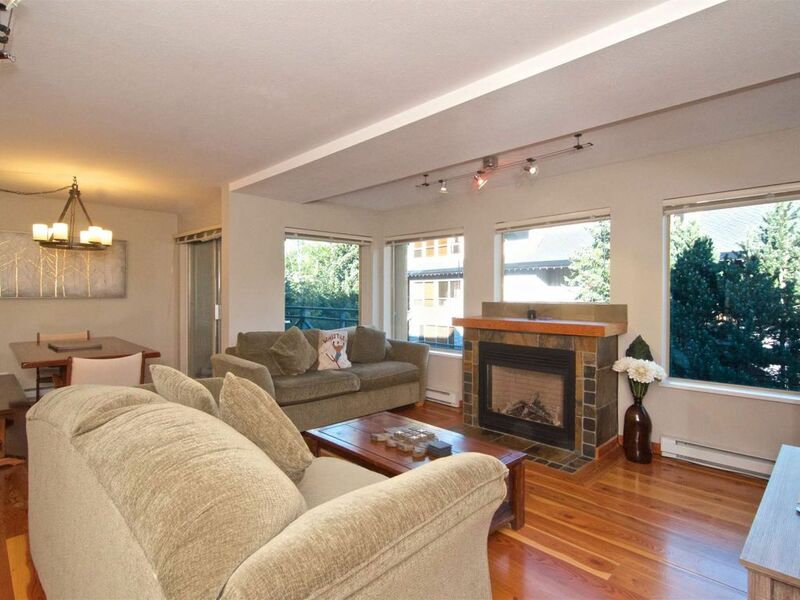 Valhalla is tucked away in a beautiful treed setting located on the corner of Northlands Blvd and Lorimer Road. Village entrance directly across the street where you will find all Whistler amenities and access to the lifts. Free underground parking. Free WIFI, and North American long distance calls. Outdoor heated hot tub located in the complex’s courtyard. iTrip rentals include a fully staffed front desk check and concierge services offering discounted lift tickets and assistance with your transportation needs. Email me your required dates or any questions and I will send you a quote in CAD allowing you to book instantly online. We recently stayed at this townhome and the place was great. We had 4 adults and 4 kids under 6. If the kids were older, it wouldn't have been so comfortable.. The kitchen is quite small. The place was well equipped and clean. The location is the best thing about this place. Walking distance to the village and really close to the playground which was great for us. We would definitely stay here again. We recently stayed at Valhalla #11 with 4 adults and 4 young kids and it was a great house! Well equipped and clean. Small kitchen but big enough dining space. The rooms are well laid out. We were able to set up a pack n play and air mattress in the master suite. Location is unbeatable!! We would definitely stay again! Very nice. Clean & good location. Enjoyed your condo. Would return. Accomodation was very comfortable for 4 adults. Location great, opposite marketplace & village. Bus stop also right out the front. Would stay here again. Thanks for the review Lea! We enjoyed our stay at this condo. The place was clean when we arrived and it is well equipped. It isn't the most spacious place (kitchen only big enough for 2 people at a time and bedroom is tight with the pullout), but they made good/practical use of space. Check in/check out was easy. Location was great - right across the street from the market in the village and the shuttle stop to the gondolas. Dedicated spot in underground parking garage - entrance right next to the condo. Lots of visitor spots for other cars. The only comment I have is with the sofa bed. It was pretty uncomfortable so I would suggest others not to count on it for sleeping arrangements. We had a great time, the apartment it’s really nice, it has everything you need and it’s very close to de ski area and the village. Thanks Mariela for the kind review!